Steel siding includes a variety of building cladding made from steel, which is an alloy of iron that contains a small amount of carbon. Long preferred as a siding material for industrial and commercial buildings because of its durability and lack of required maintenance, steel’s plain appearance has historically made it an unpopular choice for residential siding. CCPIA inspectors should familiarize themselves with it and pass along maintenance tips to their clients. Sheet iron and steel clapboard siding were patented in 1903. Sears, Roebuck & Company began offering embossed steel siding in stone and brick patterns in the 1930s. During this time, rural North America saw a shift in agricultural practices from animal-driven to equipment-dependent, necessitating a quick and economical method of constructing farm outbuildings to house machinery and supplies. One popular result was structures known as pole barns, which used debarked, de-limbed sections of tree trunks to support the outer walls and roof, which were composed of galvanized, corrugated or grooved sheet steel siding. The buildings proved extremely durable, as they still dot the rural American landscape today. Barn designs have since evolved based on aesthetics and available resources, but most of them still incorporate steel as a siding material, and many modern barns are constructed almost entirely from steel. Modern steel siding may be made from galvanized steel or stainless steel – a distinction that influences its vulnerability to rust. Galvanized steel is coated with a thin layer of corrosion-resistant zinc that may eventually wear away due to rust caused by moisture that may penetrate through a deep scratch caused by environmental impact or mechanical damage. The chromium in stainless steel serves the same purpose as the zinc on galvanized steel, except that the chromium is mixed throughout the steel. As a result, the chromium cannot be worn away, which makes stainless steel comparatively more corrosion-resistant than galvanized steel. Steel that is engineered to be rust-resistant, combined with the application of rust-inhibiting epoxies and paints, has allowed steel siding to compete with aluminum, which is cheaper, lighter and naturally resistant to rust. Furthermore, homeowners can now choose from a huge array of steel siding patterns and colors, some of which closely resemble traditional residential sidings, such as beveled wood siding, cedar shingles, brick, and even stone. Builders and homeowners can choose from a wide variety of topcoat colors and textures, some pre-painted and others that use a vinyl, polyvinyl or a proprietary coating product of similar durability. Seamless steel encompasses a variety of steel siding which is cut to the exact length of a building, thereby eliminating unsightly seams that allow for moisture penetration and strong winds to dislodge individual panels. Seamless steel contributes to a tighter building envelope, which lowers energy bills and reduces greenhouse gases. Steel log siding replicates the rustic appearance of a log cabin without any seams or vulnerability to rodents, decay or the other problems inherent in log homes. For additional strength and rigidity, builders often use corrugated steel siding, which comes in a variety of profiles, from large-scale “barn roof” sizes that provide dramatic light and shadow, to smaller profiles used in decking. Corrugated steel is more difficult to clean, however, and attaching signs and other objects can be difficult. color retention. Steel will not fade, unlike aluminum siding, which fades over time and acquires a chalky texture from the effects of weathering. energy-inefficient. Compared with non-metal sidings, steel easily transfers heat between the living area and the exterior, which will elevate energy costs and indoor temperature regulation. An energy-efficient design using steel siding requires the installation of an insulating material beneath the steel. Steel is also a non-renewable resource and it requires a comparatively large amount of energy to manufacture. oil canning. Moderate deformation, waviness, or buckling of sheet material. It is typically caused by uneven stresses at the fastening points. easily, exposing the area to the hazards of unsightly rust. If the siding needs a new coat of paint, first scrape off all debris, caulk or rust from the surface and spot-clean any stains with a scrub brush using vinegar and water. Avoid the use of corrosive cleaners. Then, apply a coat of rust-retardant metal primer intended for steel siding before applying a coat of acrylic house paint over the metal primer and allow it to dry. CCPIA inspectors uncertain of a building’s siding type can use a magnet to identify steel, as no other popular siding type is magnetic. The presence of rust also indicates that it’s steel. In summary, steel siding shares advantages with aluminum siding, but its difficult installation and the problems caused by corrosion make it an unpopular choice for residential siding. 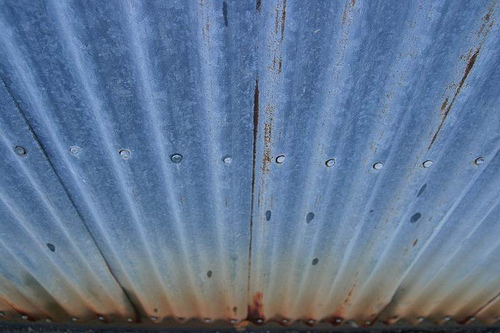 Nevertheless, the network for commercial property inspectors should learn the characteristic qualities and defects of steel siding, which may be found in residential, commercial and industrial applications. More information can be found in the International Standards of Practice for Inspecting Commercial Properties (ComSOP).